f he were alive today, Gamal Abdul Nasser would be turning 100 this Monday (January 15). Egyptians, and Arab Nationalists across the Middle East, are commemorating the birthday of their former leader, who died on September 28, 1970, at the young age of 52. He has since been hailed across the Arab World as the “godfather” of Arab Nationalism. 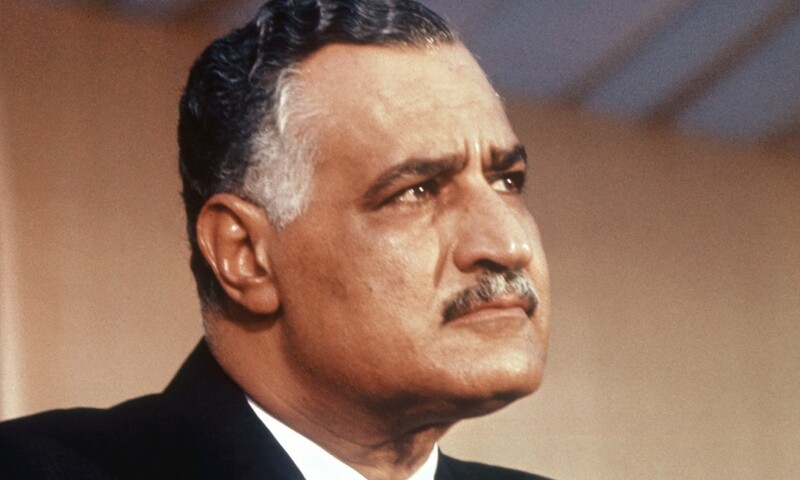 After years of neglect under President Hosni Mubarak (1981-2011) and systematic character demolition under the Muslim Brotherhood regime of Mohammad Morsi (2012-2013), a newfound interest is emerging in Nasser, a man admired and respected by Egypt’s current president, Abdul Fattah al-Sisi. 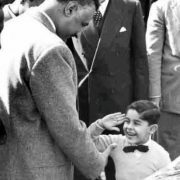 Shortly after staging his coup in the summer of 2013, a black and white photo of Sisi as a six-year old child saluting Nasser went viral on social media networks. He probably never imagined that he would one day be walking in Nasser’s footsteps, more than 50 years later. Sisi sees strong similarities between himself and Nasser. Both graduated from the country’s Military Academy and seized power through military coups, establishing strong central governments that and waging war against Muslim Brotherhood (which has been outlawed, now as then). and turned it into a museum honoring Nasser’s legacy. When Sisi staged his coup in 2013, Nasser’s oldest surviving son, Abdul Hakim Nasser, joined demonstrators in Tahrir Square, expressing solidarity with the general. He then appeared on Egyptian television to state that the family of Gamal Abdul Nasser stood firmly behind Sisi’s bid for the presidency. The similarities between Nasser and Sisi end there, however. For starters, Nasser hailed from a peasant background in the Egyptian countryside, while Sisi was born and raised in cosmopolitan Cairo. Nasser pursued a radical socialist program, nationalizing land, industry, banks, and private enterprise, while Sisi is pursing a free market economy and encouraging foreign investment. 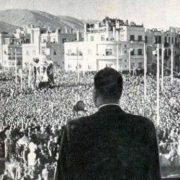 Nasser was also a highly charismatic speaker whose speeches attracted crowds from all over the Arab World. Sisi, by comparison, doesn’t possess that speaking skill and has been limited to a local, though large, Egyptian audience only. Nasser, meanwhile, was a staunch ally of the Soviet Union and a fervent opponent of Israel. Sisi is currently flirting with Russian President Vladimir Putin, but he remains highly committed to the 1978 Egyptian-Israeli peace agreement, known as the Camp David Accords. By the time Sisi graduated from military school in 1977, Egypt was already on its way to signing its peace with Israel. Nevertheless, Sisi is banking strongly on the Nasser legacy, which still inspires and unites Egyptians. 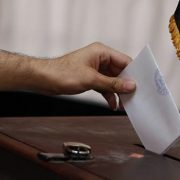 The people of Egypt are badly in need of a unifying figure they can trust, having gone through tremendous upheaval since the outbreak of the anti-Mubarak popular revolution in January 2011. Familiar faces were wiped out, seemingly overnight, and quickly replaced with political newcomers, who also disappeared after the Sisi coup. Born to a humble postman in 1918, Nasser rose to fame during the first Arab-Israeli War of 1948. Besieged by the Israelis, he and his troops became overnight champions in Egypt. He helped set up the Free Officers, a coalition of young officers that would stage a coup in July 1952, toppling the Egyptian monarchy and King Farouk. The eldest among them, General Mohammad Neguib, then 52, was installed as president, while the young Nasser, aged 34, took a backseat as interior minister and vice-chairman of the Revolutionary Command Council. In February 1954, he secured Neguib’s resignation and assumed the presidency for the next 16 years, until his death. His era was marked with upheaval from day one. In October 1954, he barely survived an assassination attempt while delivering a speech in Alexandria, carried out by a member of the Brotherhood. Two years later, Nasser famously nationalized the Suez Canal, sparking a military confrontation with Great Britain, France, and Israel. 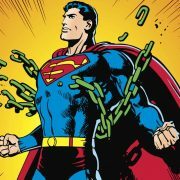 The move was in direct response to the World Bank’s refusal to finance the Aswan High Dam, and came after a bitter defeat inflicted on his troops by the Israeli Army in Gaza that prompted him to embrace the Soviet Union and purchase arms from the Eastern Bloc. The Suez War started in late October 1956 and ended in Nasser’s favor, thanks to high-level pressure for a ceasefire from the then-US president Dwight Eisenhower. Homage has been paid to Nasser’s leadership throughout the Suez Crisis in films, television dramas and books. Following that triumph, in 1958 a group of Syrian officers boarded a plane at Damascus, without authorization from their government, and headed to Cairo. So inspired were they by Nasser’s successes that they pleaded with him to unite Egypt and Syria – and effectively offered him their country on a plate, no strings attached. Nasser agreed, merging Syria and Egypt in February 1958. Syria’s then- president, Shukri al-Quwatli, stepped down, making Nasser president of the ‘United Arab Republic.’ What was intended to last for 100 years collapsed in September 1961, however, when another group of Syrian officers staged a coup, toppling the union regime and restoring civilian rule to Damascus. Nasser was accused of having established a police state modeled on that of Egypt, of socializing the Syrian economy through his economic policies, and of militarizing society via the free hand given to his director of intelligence, Abdul Hamid Sarraj, a ruthless man by all accounts. He was also accused of exercising favoritism towards Egyptians at the expense of his Syrian subjects. Nasser never overcame his ouster from Syria, which was the first setback in his until-then illustrious career. Its date – September 28, 1960 – was exactly ten years before his death. He would later send troops into the Yemeni Civil War, supporting republicans against monarchists in a campaign that weakened his army ahead of the second major Arab-Israeli War of 1967. Known as the Six Day War, the latter conflict led to the crushing of his entire air force and to the occupation of the Sinai Peninsula. The Syrian Golan Heights were also occupied, as was the West Bank and East Jerusalem. 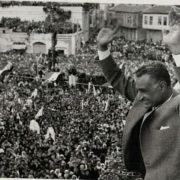 Devastated by the drastic military defeat, Nasser resigned from office in June 1967 but immediately returned, at the request of the Egyptian and Arab street. King Hussein of Jordan famously said: “Only Nasser got us into this mess and only Nasser can get us out.” Popularly used to describe the war, the term “Naksa” – meaning setback – was taken from Nasser’s resignation speech. Nasser subsequently waged a “war of attrition” against the Israelis from 1967 until 1970. His last act as president was hosting Arab leaders in talks aimed at ending the bloody confrontation between the Palestinian troops of Yasser Arafat and the Jordanian Army of King Hussein. When he died, many speculated that he had been killed, although no substantial evidence has ever been produced to back their theories. Published in Asia Times on 14 January 2018.
http://samimoubayed.com/wp-content/uploads/2018/09/000_APP2000043006200-960x576-1515913073.jpg 576 960 Sami Moubayed http://samimoubayed.com/wp-content/uploads/2016/08/logo2.png Sami Moubayed2018-01-14 15:50:232018-09-06 15:57:26Nasser at 100: how to remember the ‘godfather’ of Arab Nationalism?